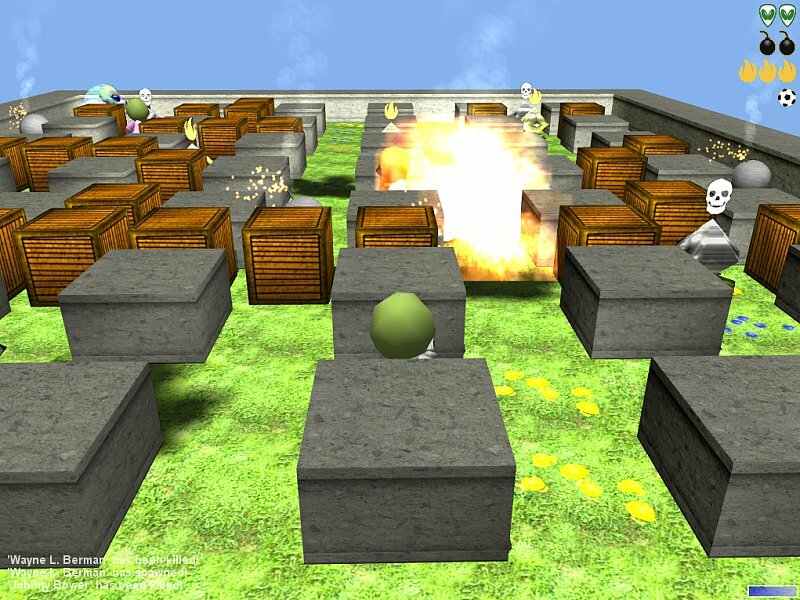 The first beta release of my bomberman inspired game is out. I decided to call it robombs...that was the first internal working title for it, because i wanted to use robots as player models first. I'm not doing this anymore, but i decided to keep the name anyway. Its main focus is multiplayer. It has a single player mode, but the bots are quite dumb...no real challenge at all. Anyway...after clicking into the main title screen (which looks still bad...), a server browser comes up which shows all active servers in the LAN and lets you start a new one. You may also click on "single player" to start a single player game instead. A single player game is nothing more than a multiplayer game with 5 bots, all levels and no human opponents. You can easily set it up yourself this way. The button is just a short cut. Wow, this is REALLY fun! Awesome work! maybe you may wish to publish the game api some people can write bots ? just a suggestion..
That's not a suggestion, that's a kind way of saying that they are quite dumb ATM... However, i'll release the sources once i consider it to be stable/complete enough. Oops. When I press "Single Player" it hangs on my box (tried it few times...). Maybe your firewall blocks it? Any exceptions visible (you may have to enable the Java console for webstart to see them)? I can't seem to download it on my phone modem. Keep losing connection and it doesn't seem to cache. Maybe a webstart problem...i'll add an addional non-webstart download later. Maybe that will work better on your modem. It contains everything to run it on Windows. If you are or Linux or Mac, you've to replace LWJGL's native parts with the ones for your OS. Remember to use LWJGL 2.0rc1 or rc2. 1.1.4 or lower won't work with this release. Pretty fun. I don't really understand the game, but it was kind of fun setting bombs and running away before they blew up. It's basically Bomberman...all you do is plant bombs and try to avoid the bombs of others...well, and your own ones too. It's great fun in multiplayer.